OVERVIEW: The animals at the Franklin Park Zoo break their time-honored code of silence and reveal that they can talk in the family-friendly comedy Zookeeper, coming to Blu-ray™ Combo Pack, single disc Blu-ray, DVD and Digital October 11 from Sony Pictures Home Entertainment. 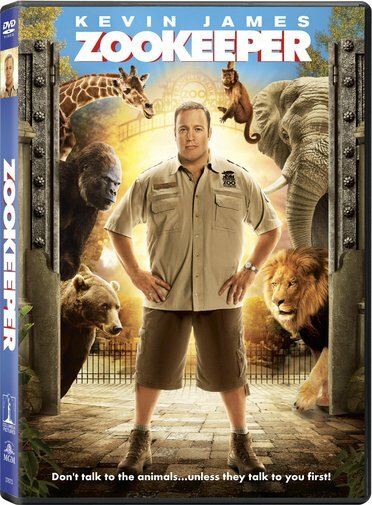 Kevin James (Grown Ups, Paul Blart: Mall Cop) is loveable zookeeper Griffin Keyes, who finds true love with a lot of help from his talking animals. Zookeeper also stars Rosario Dawson (Seven Pounds) and Leslie Bibb (Iron Man 2). 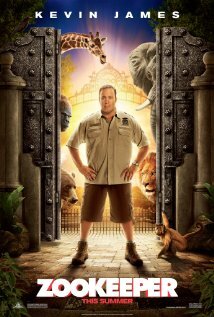 FILM REVIEW: Apparently Zookeeper looks just like Paul Blart: Mall Cop, however it is not is actually better. Well! Not actually a classic, just better. Like it was expected the screenplay in this film is as silly and absurd as it can be, but sometimes well performed and presented silly situations can make a film fun and entertaining. That is the case with Zookeeper. Another Happy Madison production film that doesn't serve any intellectual enrichment to the brain, other than provided some quality laughs, making the film enjoyable and not a complete waist of time. All thanks to Kevin James, who in this film shows ones again his ability to lead a role in the big screen. DVD: The film is presented in widescreen with a 2.40:1 aspect ration preserving its theatrical format. Sony Pictures Home Entertainment has done it again with this transfer. Not only the picture looks excellent in this release, also the sound it is good. A Dolby Digital English, French Spanish and Portuguese 5.1 Surround providing a nice complement to the picture it also includes English, French and Spanish subtitles.